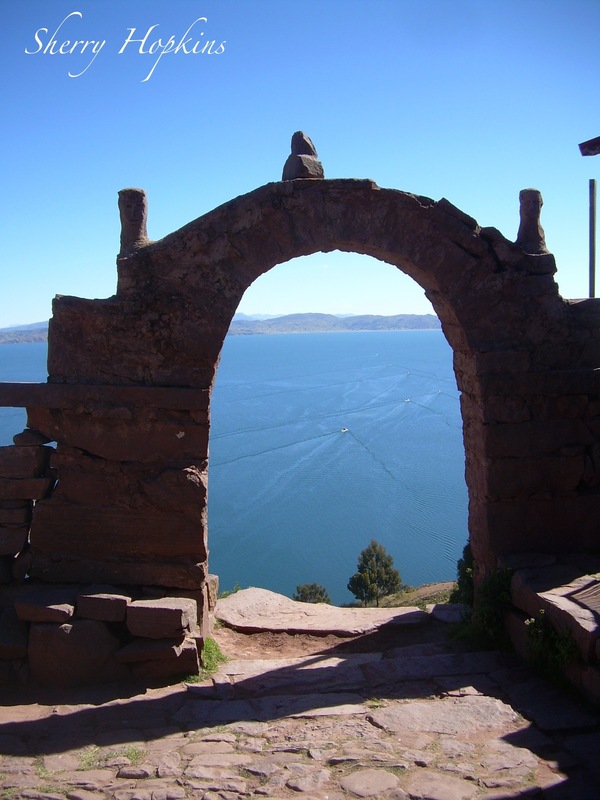 The next stop on my three-week tour of Peru through GAP Adventures in 2009 was Lake Titicaca. It is the highest lake in the world–somewhere around 12,500 ft.–and is stunningly gorgeous! It’s the largest lake in South America. This is the Island of Taquile where we stopped for lunch, before being transported to the Island of Amantani, where we were split into groups of two or three, to stay overnight with various families. There are no cars or hotels on the Island of Amantani. This is our top service the advantage of this trip is the time of navigation wi-ch is reduced at less than half in that way the visits to the islands are longer and pleasant having the chance to interact with the local families also allows to take other routes less visited with a very good lunch provided by the locals the hike on taquile island allows to enjoy the spectacular landscape and the view of lake titikaka. 11:00 hrs. Arrival on Taquile island. 13:30 hrs. Optional hike around the island. 14:30 hrs. Departure from Taquile island. DEPARTURE: 7:30 am -3:30h- daily. Be ready from 6.45am for transfer from your hotel to the port and by motor boat we travel to one of the UROS islands where you can observe the lives of the people who live on floating reed islands some only 20 meters in length. After a beautiful 2 hr boat ride we reach Taquile Island where we will tour around the ruins and visit these beautiful people, world famous for their intricate and fascinating weavings, after you purchase lunch we will return to Puno. Arrival in the afternoon and transfer back to hostel. Please note. This tour departs from Puno. *Shared service, or private services, please mentioned in your reservation. Special prices for groups or students. The Puno region can experience “all seasons in one day” therefore it´s wise to take a warm hat and gloves, as well as s sunhat, when you leave in the morning, in order to be prepared for all eventualities. Jumbo Travel, gives to you this stunning trip with one nights hotel*** in Puno, allows to visit one of the highlights on the lake “the Uros floating islands” an ancient ethnic group of people living on lake Titicaca since pre-Incan times, they are still maintaining their original lifestyle just fishing, hunting birds, gathering eggs and using the reeds almost for everything even to eat. The men are excellent sailors and the women are expert weavers. 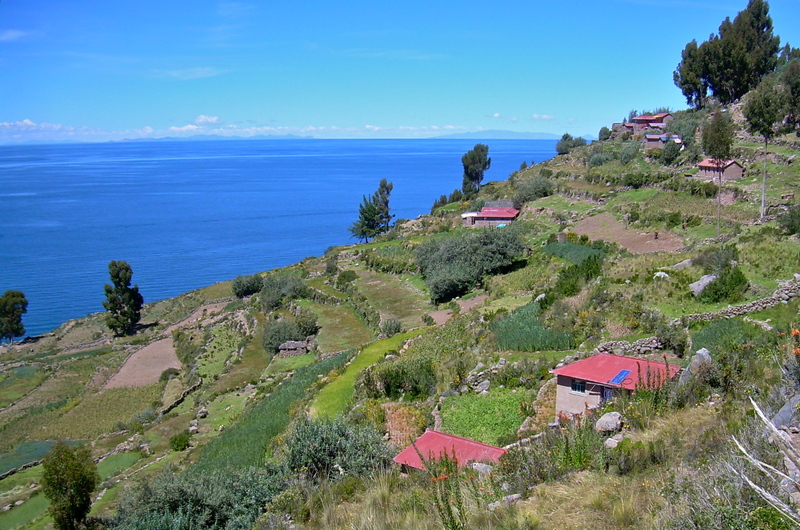 To visitors to Lake Titicaca, a boat trip to the floating islands, a unique tourist destination, is a must. These islands are made and re-made from the totora reeds which provide home, sustenance and transportation for their residents. About a two hour boat ride from Puno, on the Peruvian side of the lake, the largest of about 40 islands and the main destination is the island of Santa María. These floating islands are the home of the Uros tribe, one which pre-dates the Incan civilization. According to their legends, they existed before the sun, when the earth was still dark and cold. They were impervious to drowning or being struck by lightning. They lost their status as super beings when they disobeyed universal order and mixed with humans, making them susceptible to contempt. They scattered, losing their identity, language, and customs. They became the Uro-Aymaras, and now speak Aymara. Because of their simple and precarious lifestyle, the Incas thought them worth little and accordingly taxed them very little. Yet the Uros, with their basic reed homes outlasted the mighty Incas with their huge stone temples and mountain-top enclaves. The totora is a cattail type rush growing native in the lake. Its dense roots support the top layer, which rots and must be replaced regularly by stacking more reeds on top of the layer beneath. The islands change in size, and more are created as the need arises. The largest island is currently Tribune. The surface of the islands is uneven, thin, and some liken walking on it to walking on a waterbed. The unwary might not notice a thin spot and sink a leg or more into the frigid waters of the lake. 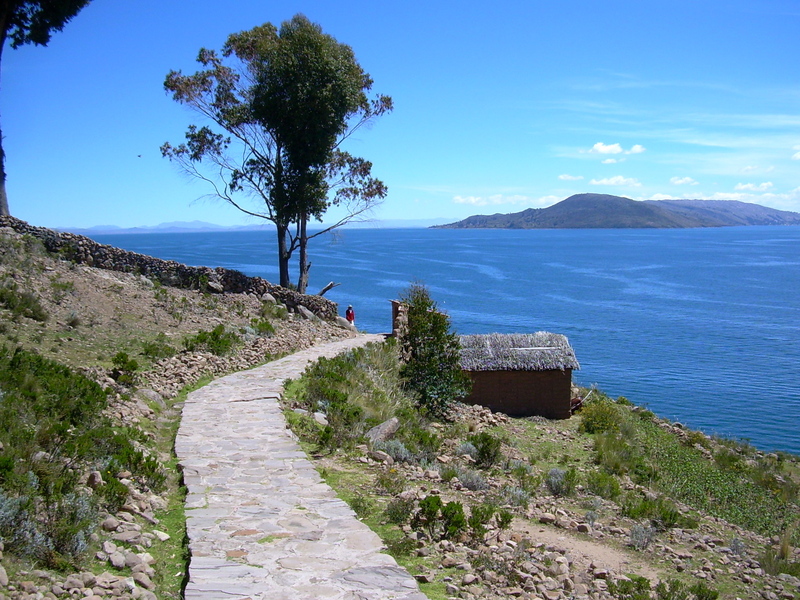 The islands are part of the Titicaca National Reserve, created in 1978 to preserve 37 thousand hectares of marsh reeds in the south and north sectors of Lake Titicaca. The reserve is divided into two sections, Ramis, in the provinces of Huancané and Ramis; and Puno, in the province of the same name. The reserve protects over 60 species of native birds, four families of fish and 18 native amphibians species. There are three islands in the lake, Huaca Huacani, Toranipata and Santa María. The floating islands are protected within the Bay of Puno and are home to 2000 or so Uros, who claim to have “black blood” are consequently immune to the cold. They call themselves be kot-suña, or people of the lake, and consider themselves the owners of the lake and its waters. They continue living by fishing, weaving and now, tourism. They catch fish for themselves and to sell on the mainland. They also catch shore birds and ducks for eggs and food. Occasionally, if the level of the lake decreases, they may plant potatoes in soil created by the decaying reeds, but as a norm, they are not agricultural. The reed boats quite often have an animal face or shape on the prow and are a favorite photographic subject. The Uros residents of the islands create their homes from the reeds. The roofs are waterproof but not humidity resistant. Cooking fires are built on a layer of stones to protect the reeds. Residents wear layers of clothing, mostly woolen, to protect themselves from the cold, the wind, and the sun which at this altitude can burn fiercely. Many women still wear the distinctive derby type hat and full skirts, see below the itinerary. Please note. This tour departs from Puno. 01 Night hotel *** in Puno which is (Puñuypampa) optional without hotel. If you have ready then. Recommendable to be in Puno, 1day before to start the trip, altitude conditions. Servicio A-1, la ventaja de esta excursión es el tiempo de viaje que se reduce a menos de la mitad y por lo tanto las visitas son más prolongadas, lo que permite tomar rutas menos frecuentadas y disfrutar de encuentros con las familias locales y tejedores. Se puede apreciar la elaboración de los famosos textiles de Taquile con calma y se escucha de los mismos tejedores la interpretación de su cultura, su vestido, su realidad. HORA DE INICIO : 8:00 am. Retorno: 15:30 pm. 7:45 am. : Se empieza a recoger a los visitantes de sus hoteles en el centro de Puno. 8:00 am. : la lancha parte en dirección de las islas flotantes. VISITA DE LAS ISLAS FLOTANTES DE UROS. 11:00 am. : Llegada al muelle de la Isla de Taquile. Empezamos la caminata hacia el lugar donde encontramos a los tejedores. Durante una hora y media disfrutamos de los encuentros con las familias de habitantes, la observación de los diseños textiles de Taquile, la interpretación de la ropa tradicional y la forma de vida de la gente de Taquile. Donde también será el almuerzo. 13:30 pm. : Se inicia el regreso hacia el muelle principal de Taquile. 14:30 pm. : Salida del muelle principal de la Isla Taquile. 15:30 pm. : Se llega al muelle principal de la Ciudad de Puno y trasladamos a los pasajeros de regreso a sus hoteles. Guía bilingüe ( Ingles & Español ). Almuerzo en Taquile Adicional ( S/. 15 ). Casaca Impermiable ( Octubre a Marzo). Después de un delicioso desayuno típico continuaremos a la siguiente isla de Taquile, la navegación llevara por 1 hora de viaje, usted tendrá la última oportunidad de conocer suficientemente. La mayoría de la gente de Taquile muy colaboradora y bien organizada. Es la razón de que los Taquileños han demostrado su alto grado de avance en la Textileria, recibiendo su galardón por laUNESCO. Cabe resaltar que el hilado y el tejido son hechos principalmente por los hombres, comenzando a la edad de ocho años. Las mujeres hacen exclusivamente de hilados y tejidos. La vida en Taquile es todavía en gran parte sin cambios por la modernidad. La visita se hará un promedio de 2horas, y 1 hora tendrá para degustar de un delicioso almuerzo típico, si realmente usted quiere ser parte de esta comunidad, usted voluntariamente puede colaborar comprándole alguna de sus artesanías. Para que así esta comunidad tenga algunos medios de sostenibilidad, de esa manera ellos podrán seguir mostrando su existencia a futuros viajeros, Finalmente nuestro guía les informara la hora de regreso llegando a las 17 horas de la tarde a la ciudad de Puno. Nuestra salida empieza a las 6:45am desde su hotel. Para dirigirnos en un transporte privado hacia el muelle/o puerto principal. A las 7:15am, iniciamos la salida con dirección a las islas flotantes de los Uros, actualmente considerado La Reserva Nacional del Lago Titicaca. Así mismo conocido como el lago navegable más alto del mundo. Durante el viaje usted podrá observar una bonita vista panorámica, paisajística. Nuestro guía especializado les dará a conocer la existencia de las Islas flotantes de los Uros. En la actualidad la gente de los Uros aún mantiene su propia cultura y tradición, así como la pesca artesanal, especialmente del (CARACHI) y el pejerrey. Cuando la pesca es abundante conservan los peces secándolos al sol. También se dedican a la caza de aves silvestres y a la recolección de huevos de pato. Son 75 islas que viven en la actualidad, y cada isla está bien organiza, después de una larga y bonita visita, usted dirá adiós a los Uros. Nuestra próxima visita será la isla natural de Taquile. SEGUNDA ISLA DE VISITA – LA ISLA NATURAL DE TAQUILE. Para llegar a nuestra próxima visita, navegaremos en bote por 2 horas y media, a la Isla natural de Taquile, durante la navegación usted podrá observar la cadena de montañas (la cordillera real), no solo eso, la gente de Taquile muy colaboradora y bien organizada. Es la razón de que los Taquileños han demostrado su alto grado de avance en la Textileria, recibiendo su galardón por laUNESCO. Cabe resaltar que el hilado y el tejido son hechos principalmente por los hombres, comenzando a la edad de ocho años. Las mujeres hacen exclusivamente de hilados y tejidos. La vida en Taquile es todavía en gran parte sin cambios por la modernidad. La visita se hará un promedio de 2horas, y 1 hora tendrá para degustar de un delicioso almuerzo típico, si realmente usted quiere ser parte de esta comunidad, usted voluntariamente puede colaborar comprándole alguna de sus artesanías. Para que así esta comunidad tenga algunos medios de sostenibilidad, de esa manera ellos podrán seguir mostrando su existencia a futuros viajeros, Finalmente nuestro guía les informara la hora de regreso llegando a las 17 horas de la tarde a la ciudad de Puno. Traslado desde su hotel al puerto principal –viciversa. Si usted requiere uno de estos servicios haga su reserva.